On January 24, 2018 at 2 p.m. during the Fairbanks Interior Tourism Conference, Explore Fairbanks will unveil the Aurora and Midnight Sun Tracker, an addition to the Explore Fairbanks website. The aurora borealis and the midnight sun are two natural phenomena that are integral to Fairbanks and draw visitors from around the world. The Aurora Tracker will give real-time and three-day forecasts of northern lights data correlated to six different locations. The Midnight Sun Tracker will calculate the number of daylight hours any time of year for three different locations. Explore Fairbanks President and CEO Deb Hickok said, “This mechanism is a one-of-a-kind digital invention especially created for aurora chasers in the Fairbanks region.” She continued “this real-time calculator helps to correlate the big three factors - location, weather conditions and aurora forecast - in northern lights viewing.” The midnight sun feature allows guests to anticipate how many hours of daylight to expect when planning their visit. The Aurora Tracker utilizes these data streams in order to predict aurora viewing opportunities. Users can toggle between viewing locations, to see viewing change for different days and time of days. The six Aurora Tracker locations include Fairbanks, North Pole, Cleary Summit, Murphy Dome, Chena State Recreation Area as well as Coldfoot, 270 miles or 435 kilometers north of Fairbanks up the Dalton Highway. Chasers are encouraged to check back often as this data changes frequently. Fairbanks is a premier northern lights viewing location worldwide because of its rare position under the “Auroral Oval,” a band over the North and South Poles where aurora activity is concentrated. 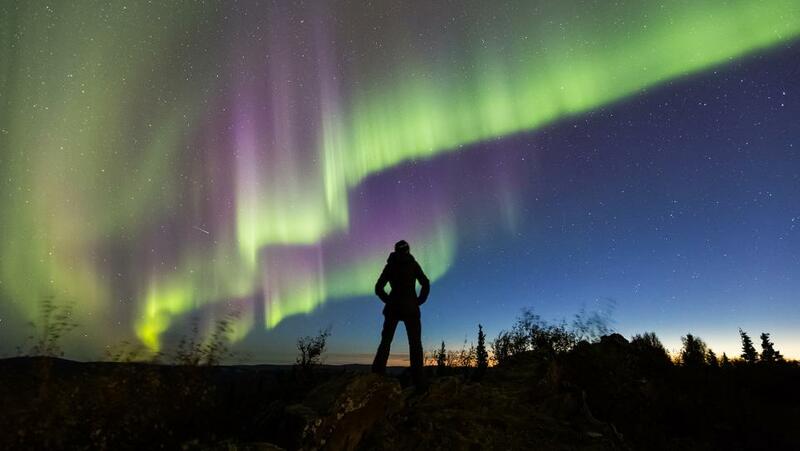 During Aurora Season, August 21st through April 21st, if visitors to the Fairbanks area spend three nights actively searching the night sky for the aurora they have a 90% chance of seeing this extraordinary natural phenomenon. The Midnight Sun Tracker calculates the number of daylight hours, also known as civil twilight, which people can experience in the Far North areas of Fairbanks, Coldfoot and Utqiaġvik (formerly named Barrow) at different times of the year. Because Fairbanks is on the 65th parallel, the area experiences 70 straight days of sunlight from approximately May 17 through July 27, and conversely, during the Winter Season, there is a significant reduction in daylight hours. The Midnight Sun Tracker allows users to change the calendar and/or location and realize the radical shift in light for the three areas. Visit explorefairbanks.com to access the Aurora and Midnight Sun Tracker, which is compatible with all devices including smartphones, tablets and desktops. Explore Fairbanks is a non-profit marketing and management organization whose mission is to be an economic driver in the Fairbanks region by marketing to potential visitors and optimizing the visitor experience. Explore Fairbanks markets Fairbanks as a year-round destination by promoting local events, attractions and activities to independent travelers, group tour operators, travel agents, meeting planners and the media as well as by developing public policy and infrastructure to achieve marketing objectives. Find out more at explorefairbanks.com.